Goal A: To set a PR for the 4-miler, faster than 34:51. Before beginning a short race recap, I'll share running goals set a year ago, and report on how I have managed. 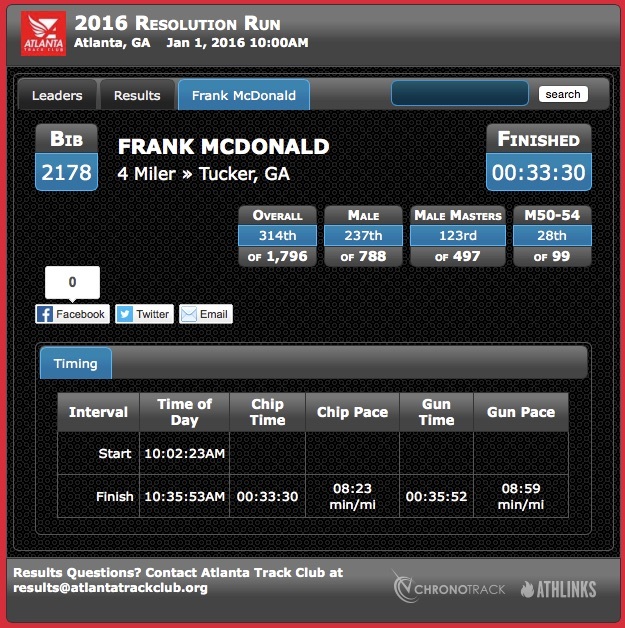 In my January 1, 2015 post, my primary goals were to 1) run the 10K distance in less than 54 minutes, and 2) have a better experience in the half-marathon distance. In summary, I'm pleased to report that I achieved both goals, in fact in the first quarter of 2015. I'm particularly pleased that all of the times were faster than 55 minutes, in a variety of conditions. Even though the Eastside Beltline course was short, my Garmin registered an average pace of 8:30 min / mile, which would been around 53:00 if I had run another few blocks! Finishing the Publix Georgia Half Marathon with a negative split was a great confidence booster. I started planning for a sub-2 hour race, targeting the Jeff Galloway 13.1 in December 2015, which I finished with a few seconds to spare! Most important, I had a good experience in each of these races, even the Hotlanta Half which was completed in a torrential downpour. 2) commit to a good stretching regime on a daily basis, without fail. The first couple of months of 2016 will be challenging for reasons that I won't go into here, so I'm not setting any big goals at this moment. 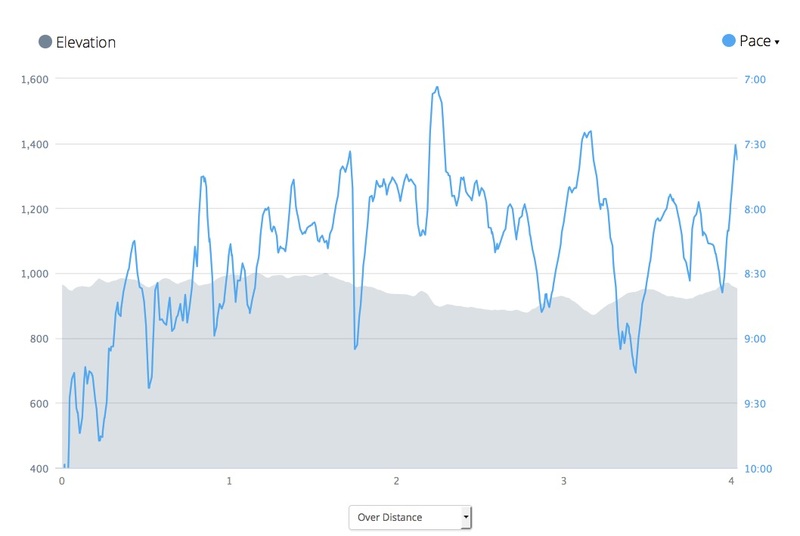 However, I had some trouble with the right IT band early in 2015, and then after the Hotlanta Half, had some chronic pain in the left gluteus. I'm not sure what has caused it, but it hasn't interfered with running until very recently. 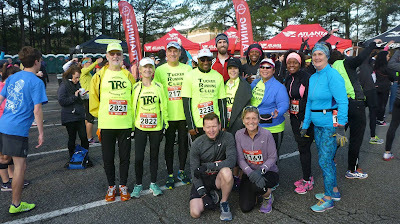 I had trouble finishing a slow 13-mile jog last Saturday, with the pain running down most of my leg, and couldn't run at all with the Tucker Running Group the following day. Fortunately I found a yoga routine that 1) I could do, and 2) helped the leg feel much better. I highly recommend this routine. It was difficult the first time through, but I felt that I was getting better and better with each repetition. Now to today's race, very briefly: I woke up early and ran through the yoga routine around 7 am, which really helped to relieve morning stiffness. We had a fairly good turnout from the Tucker Running Club, and received new T-shirts for the New Year thanks to Richard Wilson. then as we lined up for the photo, realized that we were in the middle of the warm-up exercise area! The 4-miler began at 10:00 am, and those of us in wave B (8:30 min / mile pace or better) started 2 minutes later. I decided to hang near the back of wave B. The start was a bit crowded, primarily due to the narrow roads in the Brookhaven neighborhood as well as the popularity of the race - 1796 finishers. However, that ended up working out fine for me, as I avoided starting too quickly, yet after the first half-mile I was able to run a decent pace. The route was mostly short rolling hills, although there were a couple of memorable downhill stretches where I took every advantage to fly down hill. For the most part, I passed more people than I was passed. One notable exception was in the last mile, where we were working our way up a gentle but long hill, a young man passed me seemingly effortlessly, whereas I was loudly huffing and puffing, exhaling with every fourth or fifth step. Nonetheless it was a great run for me, especially with some uncertainty at the start regarding my left leg. After the first relatively slow mile at 8:54, I managed very consistent splits for the rest of the way, 8:09, 8:03, and 8:14. That is all the more amazing when you look at how my pace seemed to vary with the hills! The elevation is the gray area, although it felt like I was running the blue zig-zags! I had the feeling that I was going to finish faster than 34 minutes, although I didn't know the course. I was delighted to see my official result at 33:30, well over a minute faster than my previous best in the 4-mile distance. Of course it probably helped that the temperature today was 35 degrees cooler than the last time I ran a 4-mile race, in mid-July 2015. Goal C: To have a good run despite some concerns with the left leg; Achieved, thanks to yoga stretches! 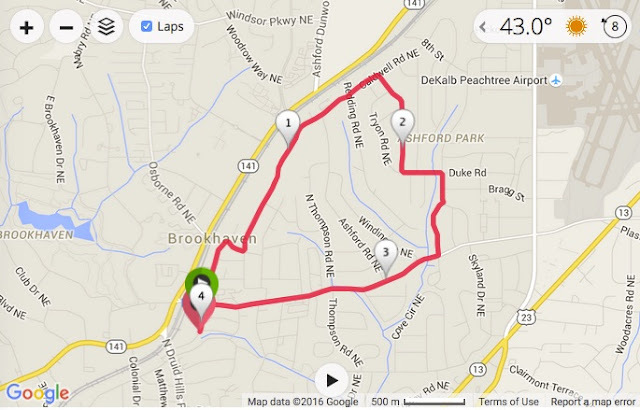 Goal B: To break my 2014 time in the 4-miler of 35:49; Achieved! Goal A: To set a PR for the 4-miler, faster than 34:51. Achieved, a new PR!